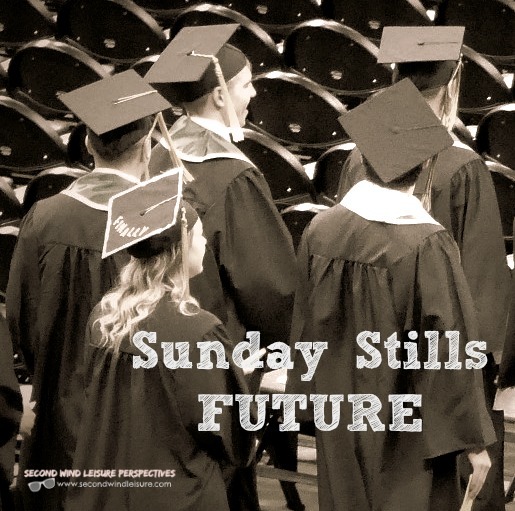 The future, the Sunday Stills theme this week, asks us to think about what this means to us. Nothing says “future” like a commencement ceremony. 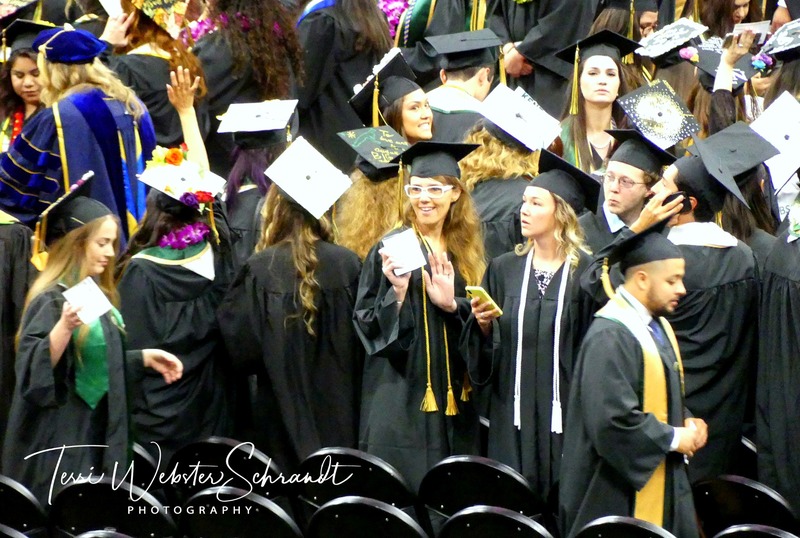 Recently I had the pleasure of attending the college graduation of one of my students (who was also a long-time employee of mine and one of my daughter’s best friends). I also witnessed several students from previous classes walking toward their futures! The smile on her face (the one in the middle in the white glasses) says it all. Her future is exciting because she moves out of state to be with her husband who serves in the Air Force. 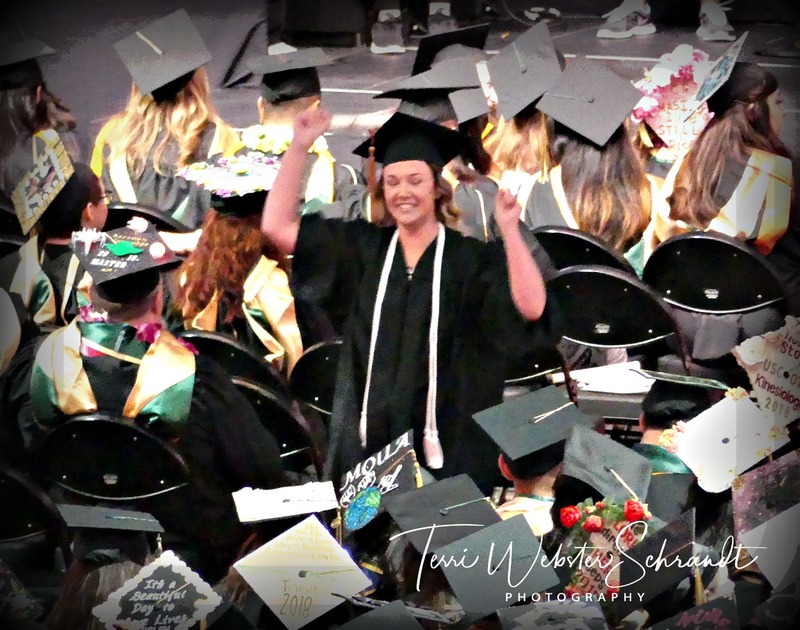 The College of Health and Human Services at Sacramento State University, where I teach, had over 1200 bachelor and master candidates for graduation for Spring 2018 out of a university total of 6,600! Impressive when you consider this includes majors in recreation and parks, criminal justice, physical therapy, kinesiology, nursing, and social work. These women and men are our future! Today’s theme was chosen by Hugh. Remember, you can always refer to my Sunday Stills page for the monthly themes always posted in advance. Your posts can be published any day of the week! The link-up is optional, but if you do link-up, please visit a couple of bloggers. What does “future” mean to you? I didn’t realize that you ran a challenge, Terri. Found it on Cee’s new list. I will definitely start participating! Hi Susan, great to hear! Happy to have you along–miss seeing your photos! Thanks, Terri. I do participate in several challenges and post a “Week in Review” on my blog and FB every Sunday. I’ve actually seen your week in review. I need to adjust my WordPress notifications so I can be sure to see yours. When I took my break I disabled most of them. It is nice to be back and sharing photography and posts again! Thanks so much, Kathy! To reply to your comment earlier, yes, I got back into blogging now that classes are over. Missed it! Thanks for choosing another one of my themes for this week’s challenge, Terri. Your photos of what the future holds, got me thinking. I thought this was a rather tough challenge (why on earth did I even think of it? ), but I finally came up with something. I’ll publish it and link back later in the week (while taking a break from getting my next book ready)! I was happy to use the theme, Hugh. Please play along when you can. Due to several other bloggers’, I have been motivated to dive back into my book on fitness. Although it might be just a toe dip for now. Go get some work done on that book, can’t wait to read it! Perfect photos of the theme, Terri. In Belgium graduating isn’t as elaborate as in the US. At least not when I received my diploma. I never had to wear the attire. 🙂 As a teacher, aren’t you allowed to every year’s graduation ceremonies? I don’t really know how that works. Maybe your university has way too many teachers to accommodate that? “Future” to me means tomorrow. Thanks, Liesbet! As a lecturer I can always attend, but I choose not to due to the traffic and other issues. This was a special occasion for sure! Thank you for that lovely comment, Tina! It is so beautiful to see young people, full of hope and promise, beginning their lives! And for you to have been a part of their getting to this point, is a wonderful feeling for you. Always the best posts, Terri! Thanks so much, Aixa! It’s the best job ever! I love this view of future! You captured the great moment perfectly! Great post, so hopeful, and beautiful at the same time. We are continuously in the future right here and now! How exciting to have their whole future ahead of them! It seems that every older generation wonders about the ability of the younger generations to carry forward, but I think we are in pretty good hands. It is exciting, Janis, and watching these commencements never gets old! Thanks so much, Sue! It was an honor to be present at a university graduation–such an amazing experience and seeing the sheer joy is just delightful! So much hope for the future for them, for us. I hope it all comes true. Wonderful photo essay, Terri. The words enhance the pics enhance the words. Thank you, Shari! I was a tad worried the low light would affect the images, but it managed to lend an air of mystery as a foreshadowing to an unknown future! Hi, Terri – You captured this week theme brilliantly! Best wishes to all Graduates! And good luck to all of them. What a wonderful occasion. What a great post and theme, Terri. You must feel like you make such a difference, Terri!! That’s so wonderful!! !